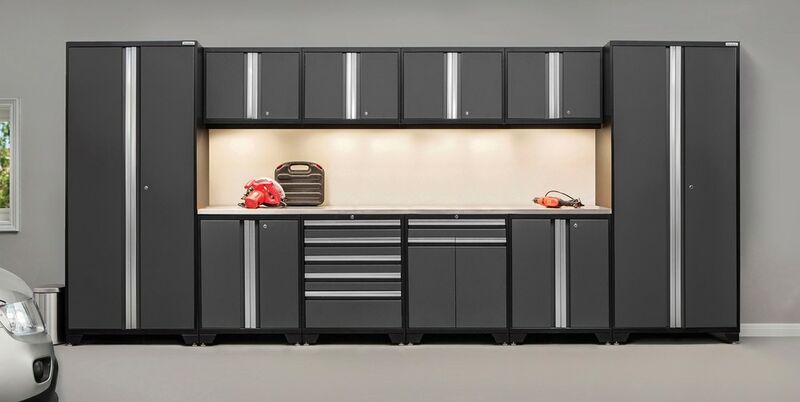 This redesigned Pro Series line by NewAge Products boasts cabinets which are fully welded and constructed with 18-Gauge steel. They require minimal assembly. The new wall cabinet has all the great features and benefits which NewAge and the Pro Series lines are known for. The Wall cabinet includes 1 easy-to-adjust shelf adjustable in 1 in. increments;, with a weight capacity of 100 lbs. It also includes a new light valance that can be mounted under the cabinet and a set of easy wall hanging brackets for a simple installation. The all-new design has 19-Gauge steel double wall doors and full length anodized aluminum handles. 1 touch and you know you're dealing with quality. The series has always been available in charcoal gray and a deep red finish.